This sample demonstrates a custom enrollment process and step-up authorization. During this one-time enrollment process, the user is required to enter his user name and password, and to define a PIN code. Prerequisites: Make sure to read the ExternalizableSecurityCheck and Step-up tutorials. When the application starts for the first time (before enrollment), it shows the UI with two buttons: Get public data and Enroll. When the user taps on the Enroll button to start enrollment, he is prompted with a log-in form and is then requested to set a PIN code. 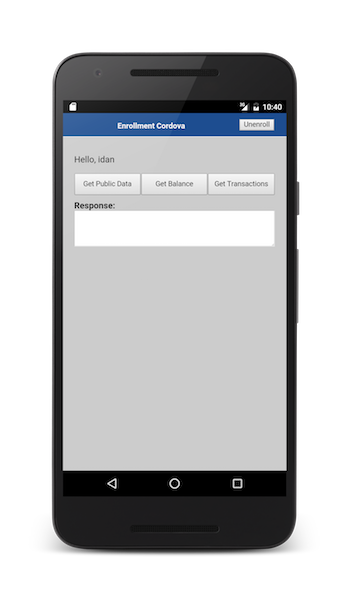 After the user has enrolled successfully, the UI includes four buttons: Get public data, Get balance, Get transactions, and Logout. The user can access all four buttons without entering the PIN code. When the application is launched for a second time (after enrollment), the UI still includes all four buttons. However, when the user clicks the Get transactions* button, he is required to enter the PIN code. After three failing attempts at entering the PIN code, the user is prompted to authenticate again with a user name and password, and to reset a PIN code. You can choose to save protected data in the PersistentAttributes object which is a container for custom attributes of a registered client. The object can be accessed either from a security check class or from an adapter resource class. The setPinCode resource adds the pinCode attribute and calls the AdapterSecurityContext.storeClientRegistrationData() method to store the changes. Here, users has a key called EnrollmentUserLogin which itself contains the AuthenticatedUser object. The unenroll resource deletes the pinCode attribute and calls the AdapterSecurityContext.storeClientRegistrationData() method to store the changes. The EnrollmentUserLogin security check protects the setPinCode resource so that only authenticated users can set a PIN code. This security check is meant to expire quickly and to hold only for the duration of the “first time experience”. It is identical to the UserLogin security check explained in the Implementing the UserAuthenticationSecurityCheck tutorial? except for the extra isLoggedIn and getRegisteredUser methods. The isLoggedIn method returns true if the security check state equals SUCCESS and false otherwise. The getRegisteredUser method returns the authenticated user. The EnrollmentPinCode security check protects the Get transactions resource and is similar to the PinCodeAttempts security check explained in the Implementing the CredentialsValidationSecurityCheck tutorial, except for a few changes. In this tutorial’s example, EnrollmentPinCode depends on EnrollmentUserLogin. After a successfully login to EnrollmentUserLogin, the user is only asked to enter a PIN code. When the application starts for the first time and the user is successfully enrolled, the user must able to access the Get transactions resource without having to enter the PIN code that he just set. For this purpose, the authorize method uses the EnrollmentUserLogin.isLoggedIn method to check whether the user is logged in. This means that as long as EnrollmentUserLogin is not expired, the user can access Get transactions. When the user fails to enter the PIN code after three attempts, the tutorial is designed so that the pinCode attribute is deleted before the user is prompted to authenticate by using the user name and password and resetting a PIN code. The validateCredentials method is the same as in the PinCodeAttempts security check, except that here the credentials are compared to the stored pinCode attribute. The getBalance resource so that only enrolled users can see the balance. The transactions resource so that only enrolled users can get the transactions. The unenroll resource so that deleting the pinCode is possible only if it has been set before. Create a Java adapter and add a Java class named IsEnrolled that extends ExternalizableSecurityCheck. Set the state to SUCCESS by using the setState method. Add success to the response object by using the addSuccess method. Set the state to EXPIRED by using the setState method. Add failure to the response object by using the addFailure method. For more information about the securityContext, see the Security API section in the Java adapter tutorial. In our sample code, the IsEnrolled challenge handler’s handleSuccess method use the user object to present the display name. The EnrollmentUserLogin, EnrollmentPinCode, and IsEnrolled security checks are available in the SecurityChecks project under the Enrollment Maven project. Click to download the Security Checks Maven project. Sample applications are available for iOS (Swift), Android, Cordova, and Web. Click to download the iOS Swift project. Click to download the Web app project.